In order for our eyes to be able to see, light rays must be bent or refracted by the cornea and the lens so they can focus on the retina, the layer of light-sensitive cells lining the back of the eye called rods and cones. 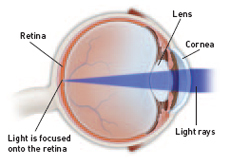 The retina receives the picture formed by these light rays and sends the image to the brain through the optic nerve. Depending on the shape of the eyeball, the cornea, lens, and retina may not work perfectly together, causing unclear vision. Because of this, many people wear eyeglasses or contact lenses. These help the light focus images correctly on the retina and allow people to see clearly.